Andy DiPietro showed this turned and carved Eastern Red Cedar sculpture he fashioned from a 30 foot log! To see more of Andy's work visit his website at woodartforms.com. Bob Crowe used a jig and his router to decorate the edge of this Spalted Maple bowl. If you want to see how he did it- come to our next meeting. Bob will be demonstrating! 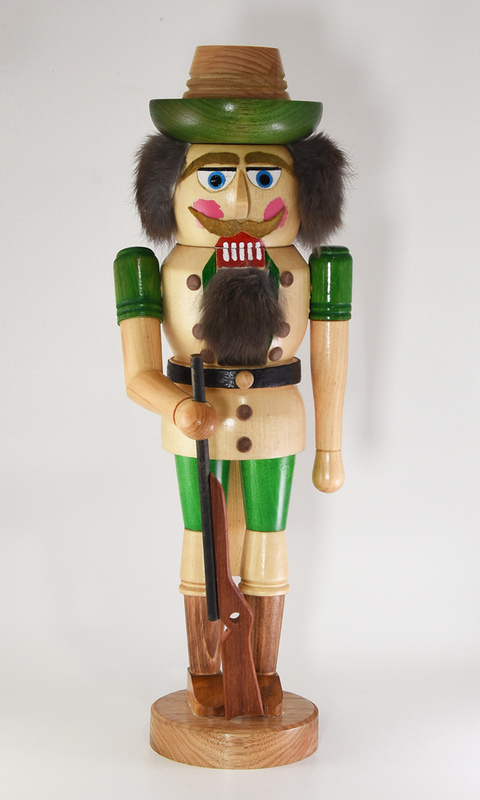 Ron Durr challenged himself to make a nutcracker and what a fine job he did! The body is Maple, the gun and hat are Padauk and the fur is rabbit. Ron was able to find the fur on the internet and didn't have to resort to a last minute hunting trip. Sal LoSapio brought in a bowl he made and saved. Like many of us (all of us) he went through the bottom and rather than discard it and, with a little help from Bob Crowe, he plugged it with Walnut. Now he has a bowl and a story to go with it. Sal is a bit of a celebrity. To read about him, click here or on the photo where he is featured in The Intelligencer! Brian Richardson was out of town for the finial challenge in December, but he was still game to make something with a finial. He was further inspired by a demonstration he saw where Mark Sfirri and Michael Hosaluk played with hollow forms and eccentric turnings. The result is this very cool piece he finished off with milk paint. And it sports a Avelino Samuel style detachable finial! Here's another inspired piece. David Giffen was leafing through books and magazines and was struck by the work of Melvyn Firmager and decided to make this from a piece of Maple Burl. To add a little excitement, David used acrylic paint to highlight the burl. While perusing the library, David came across a photo and name he recognized- our own Linton Frank and his famous Wedding Vessel. Some things just get better with age- most woodturners! John Manura continues to make new and interesting pieces with his invention, the Accu-Slice® band saw accessory. This egg has 4500 pieces of Padauk and maple! 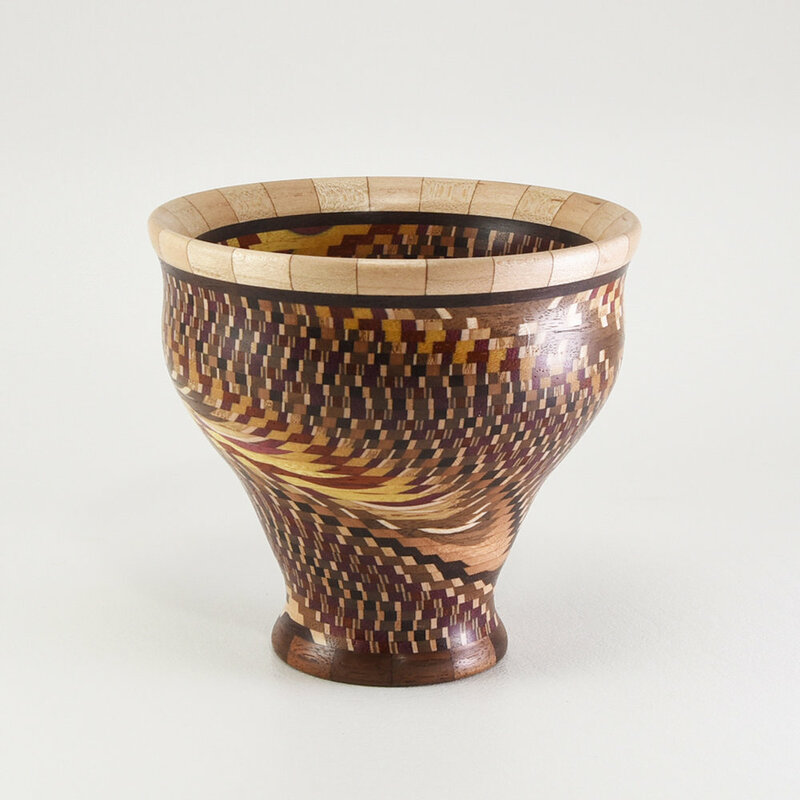 John also described how he made the "Dizzy" Bowl from progressively rotated slices. In fact, John has a whole series of videos (41 as of this writing!) you can watch. Ryan Lazaar brought along some very nice pieces, all great proof to his accomplishments as a woodturner. Ryan told of getting an old, gray board and transforming it into this beautiful Walnut dish. He burned the perimeter lines with ebony and filled the small crack with mineral filler. After winning a Maple blank in one of our raffles, he made a nice rolling pin with removable Cocobolo handles. His handsome salt and pepper shakers are also made from Cocobolo. Matt Overton was able to make this great looking Cherry bowl from a rotting log Dale Larson helped him save. You might be able to make out some turquoise and pewter filler Matt used to fill the cracks. In getting ready to teach his HOW class, Matt finished off some jewelry he's been working on and fixing. A new one for us is his Christmas Lights necklace. There are matching earrings, too! Speaking of earrings, those finial earrings in the last photo are made from 5 pieces! David Shied got stuck on a train on his way home just before the December meeting and was unable to present his Pollyanna, a nicely made lidded box with a finial he showed this meeting. David also showed us a segmented piece he made using various woods, Oak, Cherry, and Walnut. He's been experimenting with randomly ordered contrasting woods. Closing out the night was Phil Hauser. His saga of the "Cheap Mesquite" continues- that $5 pile of beautiful Mesquite that cost him $200 to ship from Tuscon, AZ (at least that's how I remember it). But Phil continues to make some really beautiful pieces from it, like the one below- a great form and what character! He did the same with his second piece made from African Blackwood. A great way to end the Show and Tell.